I attended the LOFAR inauguration on Saturday. It was excellent - a spectacular show, slightly kitschy but with plenty of wine and, of course, Queen Beatrix of The Netherlands to formally open the telescope. 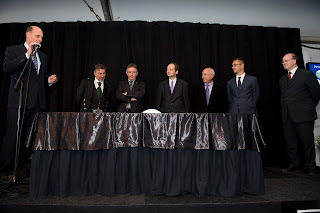 My job at the ceremony was to sign the International LOFAR Telescope (ILT) Memorandum of Understanding (MoU) on behalf of the UK as a founding member. It was quite formal !